Summer is waning and there isn’t much happening new in my yard this time of year. Except for this little gem. Beautiful, purple tricyrtis, or more commonly known as toad lily. 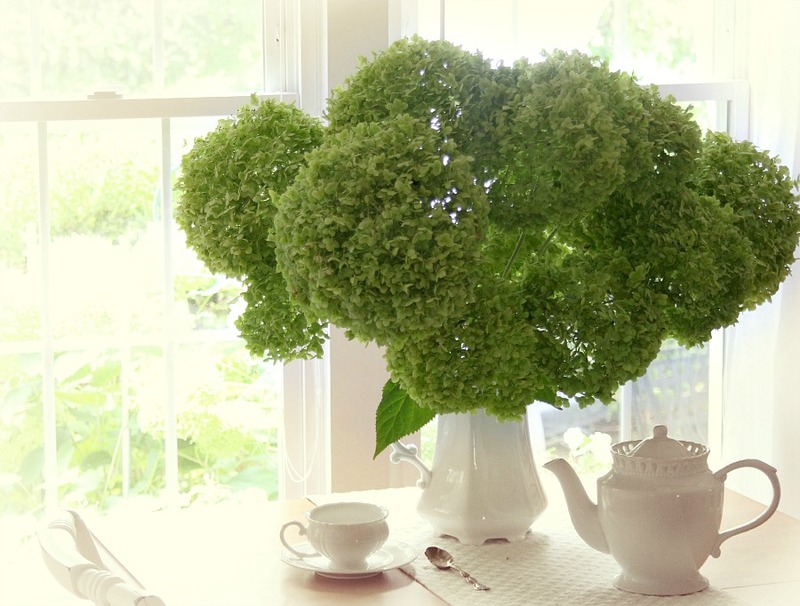 It is a shade-loving herbaceous perennial and a lovely garden plant. 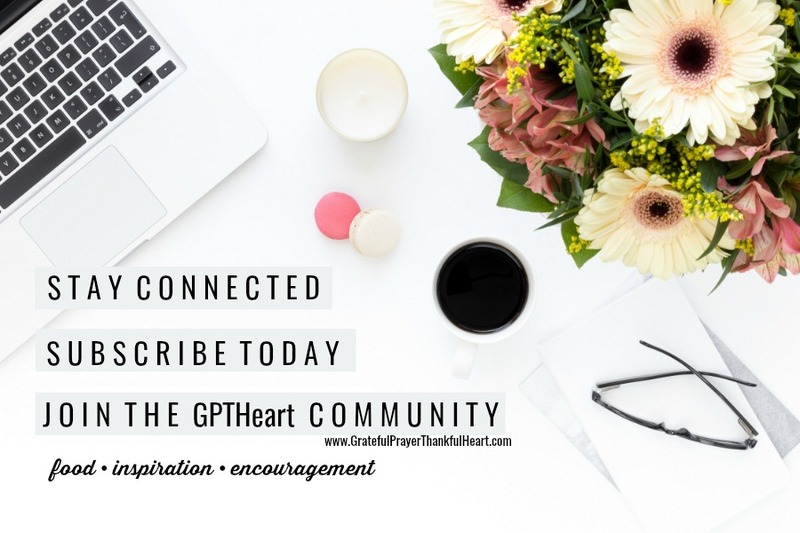 I have had such fun growing this unusual plant and am excited to share it with you. My introduction to tricyrtis began with a tiny, broken stem I found on a hike last fall. I brought it home and stuck it into a container of water and it rooted. I potted the rooted cutting in fresh potting soil in a small container and grew it through the winder near a bright window. Because of the small container, the plant didn’t get very big. But it looked healthy so I transplanted it into a large pot and placed it outside when the weather warmed. Initially, it was in a location that received too much sun. I move the container a few feet to where it received dappled light through tree leaves where it did better. And, I made sure to keep the soil watered to prevent it from drying out. The toad lily grew lots of new leaves and then I began noticing a few flowers. Beautiful flowers! 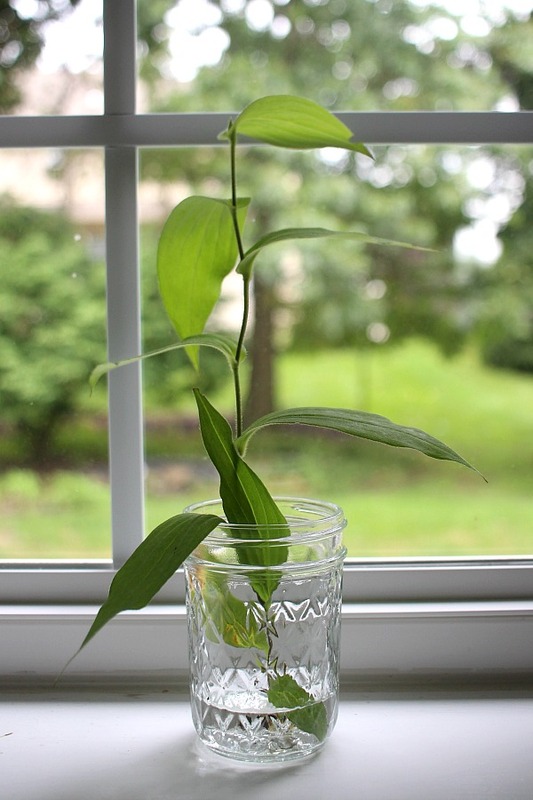 As I learn more about the ease of propagating and growing this plant, I plan to root more cuttings to plant in other areas of my yard. So here is some info, should you consider adding these plants to your garden. 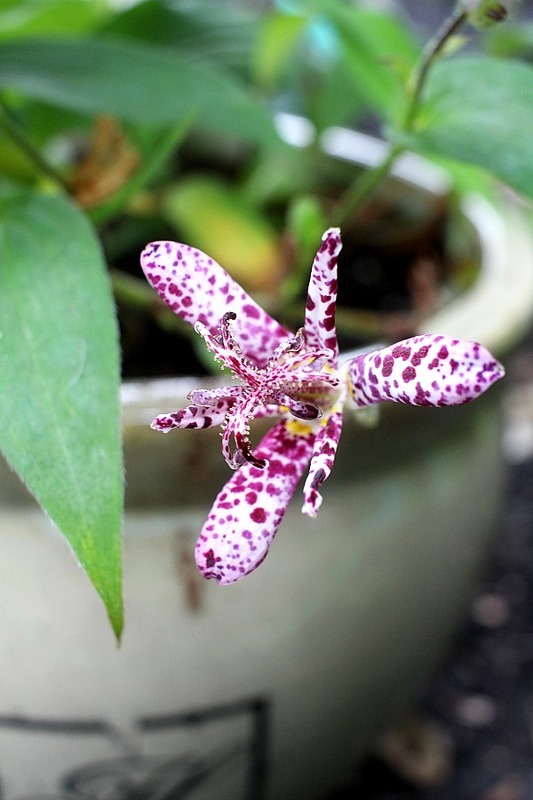 Toad Lily is quite an exotic looking flower speckled with splotches of purple and wine colors. The blossoms are smallish in size, less than 2-inches and resemble an orchid. Because of their diminutive size, they are best planted where viewing is at a close proximity. 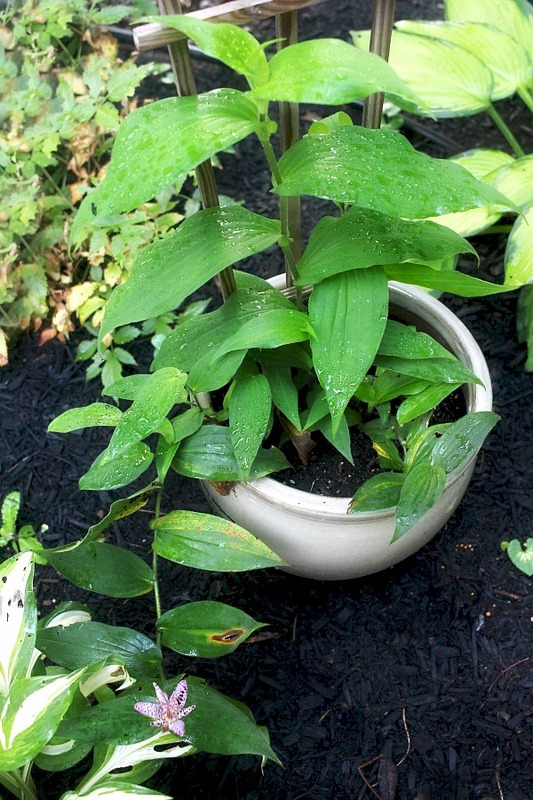 It is a perennial plant and very easy to grow in zones 4 to 9. It’s very frost-hardy, and able to withstand tough winter climates. 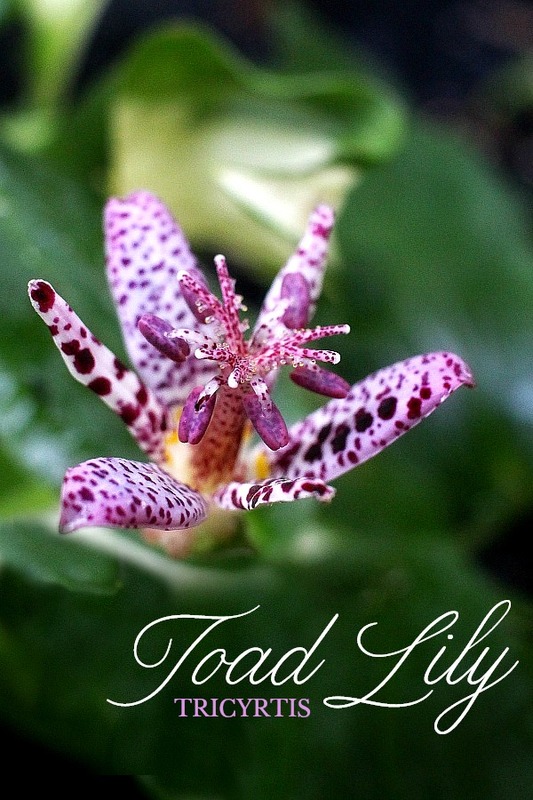 Toad lily grows by rhizomes* and likes rich, well composted, moist soil and part shade. They grow to be 2 to 3 feet tall and about as wide. I had no problem rooting a stem in water but you can also root in soil. Cut a four inch stem; dip cut edge in rooting hormone, tap off extra and place into moistened rooting medium up to the leaf axis and place in a bright, warm area. A new plant will develop at the base of the leaf. 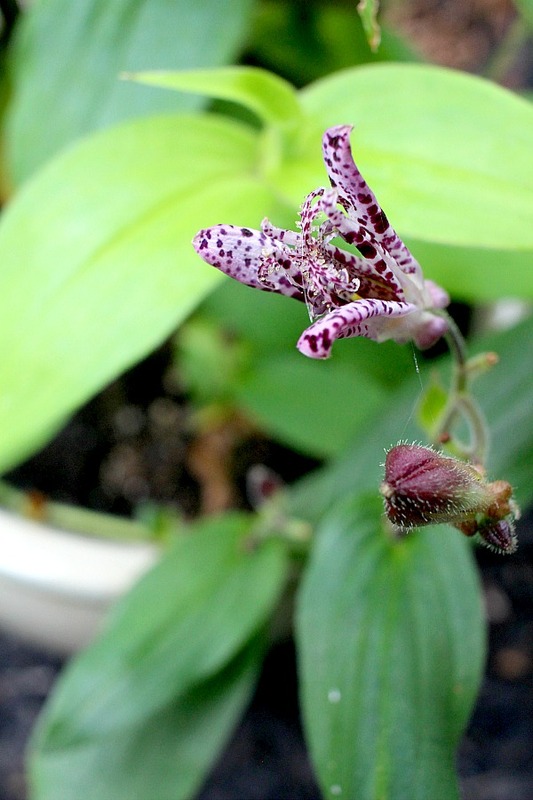 Toad Lily plants seldom need dividing, but for propagation purposes they can be divided in the spring, making certain that each division includes a new growth bud on the underground rhizome. Toad Lily seeds require light for germination so do not cover them. They require a period of cold stratification before germination. These tiny seeds should always be sown while fresh. Sow Toad Lily seeds directly in the garden in late fall, or early in the spring, up until one month before the last killing frost date. 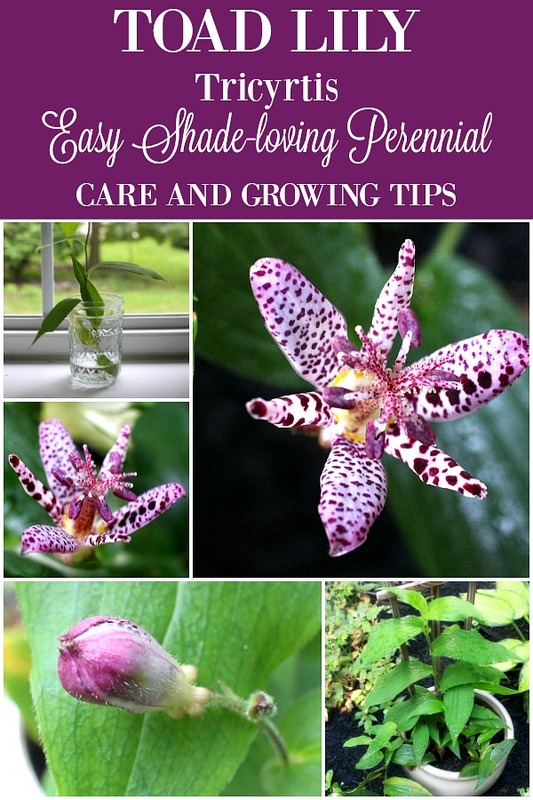 If you are starting your Toad Lilies indoors, place your fresh seeds in the refrigerator for a month (or longer) before planting. Sow the seeds onto a moist growing medium and maintain a temperature of 65°-70° until germination which takes from 4 to 6 weeks. 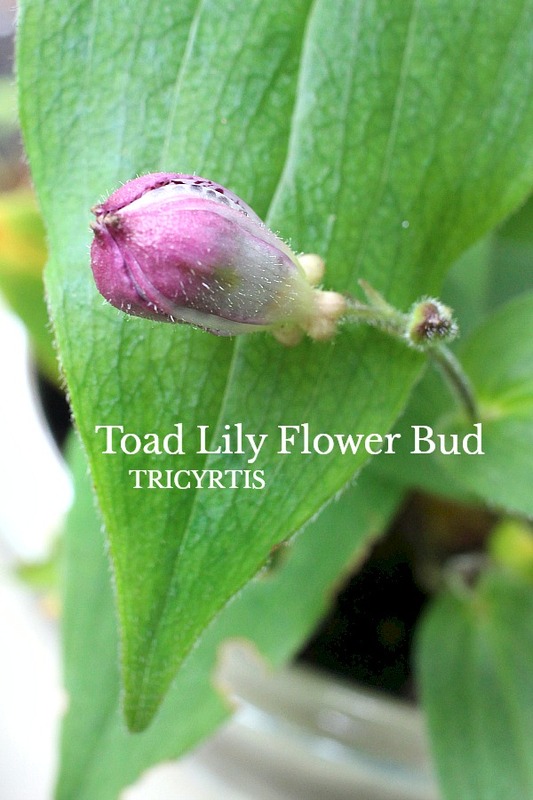 Toad Lily rhizomes should be planted about three inches deep in evenly moist, organically rich, slightly acidic soil. Water regularly and thoroughly as they do best when kept evenly moist all the time. If you notice spotted leaves or brown edges, that usually is caused by insufficient moisture. Feeding a Toad lily isn’t necessary. 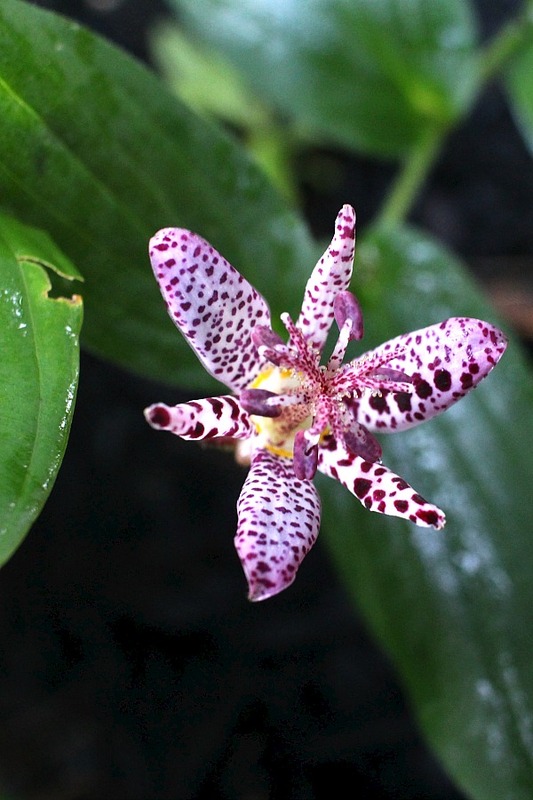 Are you familiar with Tricyrtis Toad Lilies? Have you grown them or currently have them growing in your garden? Let me know your tips and thoughts.